I grew up making watermelon-lime slushies with frozen pieces of watermelon rather than bothering with ice. The flavor turns out better and stronger that way. This is excellent with the changes I made. I used frozen strawberries instead of ice cubes. Also used 3 T. lime juice instead of 1/3 cup. 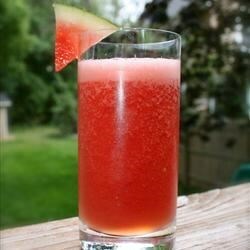 This recipe is very refreshing.I did find that the sugar needed adjusting according to the sweetness of the melon. I added only half the sugar initially then adjusted to my own taste. We added 1 container yogurt to give it some thickness.